FASOp-EdsEnergyWhat Happened at Chernobyl 30 Years Ago? What Happened at Chernobyl 30 Years Ago? The world’s worst nuclear power accident took place thirty years ago on April 26, 1986. The accident released radioactive material over parts of Ukraine and Europe and permanently displaced 350,000 people. Thirty people, mostly firefighters, died from radiation exposure within months of the explosion. The long-term health impacts are ultimately unknown, but some studies suggest there could be thousands of premature deaths due to cancer. The 1621 square mile area surrounding the reactor (bigger than the state of Rhode Island), known as the “exclusion zone,” will not be safe for people to live in for at least 175 years, though there are a few people, mostly elderly, who have returned to their homes within the zone. 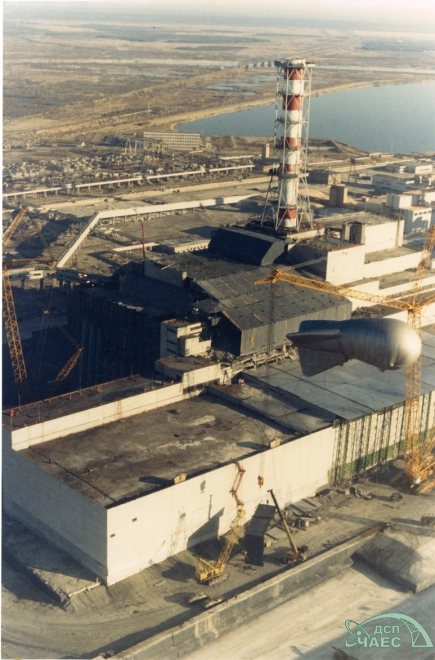 After the accident, the Soviet authorities hastily constructed a “sarcophagus” to encase the damaged area so that the other three reactors on site could continue to operate. 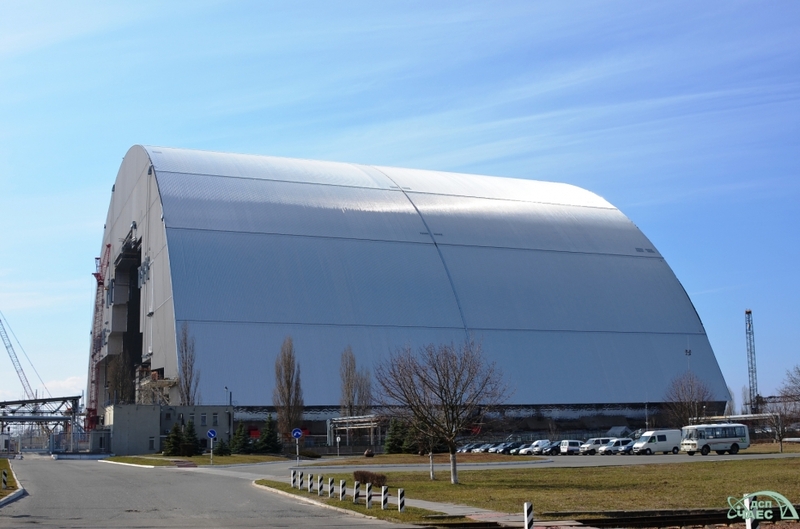 The sarcophagus was not built to last, so the international community is building a New Safe Confinement structure designed to last 100 years. It is due for completion in 2017. The enormous structure is being built some distance away due to radiation concerns, and will be slid over the old sarcophagus and reactor building on rails. So, how did the accident happen? 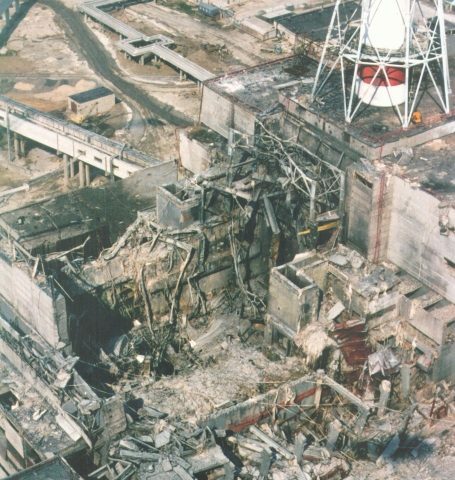 Ironically, the events leading up to it centered around a special safety test, but the ultimate causes of the accident were an unsafe reactor design, insufficiently trained plant operators, a lack of safety culture, and a culture of secrecy that discouraged operators from thinking critically and taking initiative. To understand exactly what happened, you first have to understand how the power plant works in broad strokes. Uranium or plutonium atoms are split (also known as nuclear fission or nuclear reaction), producing heat. The heat boils water, which then turns into steam. The steam spins large turbines, which look something like large fans. The turbines are attached to generators, and spinning them produces electricity. (1) In the Chernobyl reactor design, as the water circulated through the reactor, it cooled the reactor. Some of it turned into steam, and some of the steam was used to spin the turbines. Eventually, the steam was condensed back into water and it recirculated, continuing to cool the reactor. (2) Power plants control how many nuclear reactions are taking place by inserting and removing “control rods” into the core of the reactor. The control rods are made of materials which absorb neutrons. The neutrons are what cause the uranium or plutonium to split. So, by inserting the control rod, you absorb some of the neutrons and can slow down the number of nuclear reactions. By removing the control rod, you can increase the number of nuclear reactions because more neutrons are available to split the uranium or plutonium. However, the design of the control rods in the Chernobyl reactor was poor. The way they were designed, there was an increase in nuclear reactions for just a few seconds as they were inserted. (3) Also in this reactor design, when the reactor is operating at low power, an increase in the amount of steam present can cause the number of nuclear reactions to increase. This is because the water acts a bit like a control rod and absorbs some neutrons. When it turns to steam, there are more air pockets, and the steam doesn’t absorb as many neutrons as the water. So, an increase in steam leads to more reactions, which in turn generates more heat, which then produces more steam. So, back to the special safety test. The test was an attempt to see if, in the event of power loss, the turbines in the power plant would keep spinning long enough to keep the water pumps running until the emergency generators kicked in. The reactor had a safety system that would automatically shut it down by inserting control rods if it detected a loss in steam supply to the turbine. In other words, if the water pumps stopped, the reactor would shut itself down. Before the test started, they bypassed that safety feature and made sure the reactor would keep running even if there wasn’t enough water circulating. The reactor was operating at low power. Remember, in this state, more steam can lead to more nuclear reactions. The power level was too low for them to conduct the test, so they removed some control rods — too many, in fact. They exceeded the established safety standards. Only then did they start the test. The turbines shut down. The water pumps stopped. This caused a steam build up, which caused the nuclear reactions to increase, generating even more heat. At this point, they tried to reinsert the control rods to slow down the reactions, but the Chernobyl control rods caused the nuclear reactions to increase for just a few seconds after they were inserted, generating even more heat. The fuel inside the reactor started to break apart. Steam explosions destroyed the reactor core and blew the roof off the building. Fires broke out everywhere. The whole thing went down in under a minute. A lot of things changed after the Chernobyl accident. The Soviets tried to cover it up at first, but ultimately they weren’t able to keep it under wraps for long. Western governments applied intense pressure on the Soviets to provide details about the accident. Ultimately, Gorbachev was fully transparent about the accident, in contradiction to the traditional Soviet culture of secrecy. Changes were made to Soviet reactors of similar design, as well as the control rods, so that they now operate safely. Secrecy no longer abounds, and technical exchanges take place between countries. There is also now a more highly developed culture of safety. There are many lessons that can be learned from the Chernobyl accident but I think the most important one is this: Cooperation and exchange among the international scientific community is vitally important. The Soviet culture of secrecy surrounding their nuclear programs prevented input on safer reactor and control rod designs. And technical exchanges could have established industry best practices and fostered a culture of safety. Just talking to one another could have prevented the accident in the first place. Tara Drozdenko is the Managing Director for Nuclear Policy and Nonproliferation at Outrider. She has over a decade of experience in the National Security field and several years of experience managing complex government programs and supervising teams of talented researchers at both the U.S. State and Treasury departments. She earned a Ph.D. in plasma physics in 2001 and has worked for the U.S. Navy on issues related to Weapons of Mass Destruction (WMDs) and for the U. S. State Department on Nonproliferation and Arms Control issues. Thank you Tara. Greatly appreciate your knowledge, skills and abilities. Your essay above speaks to the common ground and the common good. YOUR essay appeals to a wide variety of readers quite effectively. There are similar screw-ups and sad situations within confused. Go ahead, write the sequel ! Excelently clear explanation in a few words. I like this post. great article with a very clear explanation of the root cause of this disaster, well done. I’ve read Medeveyev’s book (“The truth about Chernobyl”) and its nowhere near as clear as this article. thank you ! Tara Drozdenko is the Managing Director for Nuclear Policy and Nonproliferation at the Outrider Foundation.